At Optimus Solar, we say “Solar Makes Sense”. As a company and as individuals, we have yet to come across a situation where this is not the case. After a recent trip to South Africa to visit a project on which I serve as a director, this statement continues to ring true. In the rural Keiskammahoek Valley in the Eastern Cape of South Africa, nestled into green hills and cattle pastures, sits St. Matthews High School. Since 1856, St. Matthews has been a beacon of educational excellence in rural South Africa, a country of immeasurable natural beauty, but also one with a history of educational challenges. In 2008, I had the privilege of moving to South Africa to support educational development and greater access to technology at rural schools through a top-class public benefit organization called Sifunda Kunye (www.sifundakunye.org). St. Matthews was our first partner school and faced many and varied challenges when it came to delivering quality education and a safe environment to its students. Among its many challenges, the school has over 300 female boarding students, housed in two on-campus hostels, which had not had access to hot water since before 1980. That is 28 years without a vital resource integral to food safety and personal hygiene. 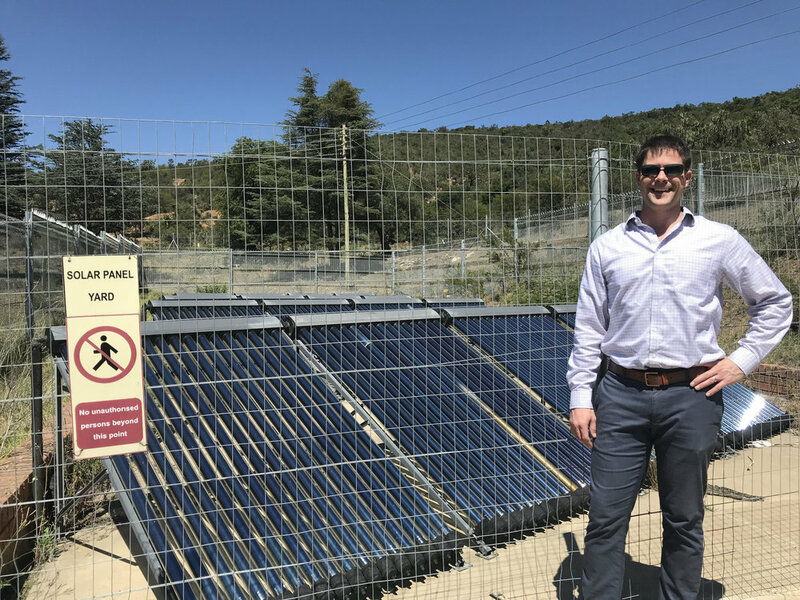 Optimus Solar President Ben Pauluhn in front of the solar panels that power the St. Matthews Girls Hostel water heating system. Electricity, basic service delivery and maintenance are all challenges to housing in this area. However, through partnerships with multiple local groups and organizations, Sifunda Kunye was able to secure a full renovation of the dormitories and teacher housing communities. This included returning hot water to campus with the installation of a solar water heating system. Now, 6 years on from the renovations, hot water continues to have 100% up-time with $0 in ongoing costs. This real-world example demonstrates not only that solar has a motivating financial payback, but that it is also the most reliable long-term solution to producing electricity and ensuring hot water availability. It works in rural communities with little to no critical infrastructure just as it works in developed communities. Solar is versatile, reliable, clean, and cost-effective. Solar truly can fit every scenario where long-term time horizons and responsible management are part of the goals. Optimus Solar is proud to play a small part in improving education and opportunities for students in South Africa, and we continue to believe that solar makes sense for everyone! St. Matthews campus and boarding students. Photo courtesy of Sifunda Kunye.